In small bowl, whisk together chile powder, cinnamon, cumin, garlic powder, coffee and black pepper. Place canola oil and turkey in mixing bowl and add dry seasoning marinade. Using a fork or your hands, mix to coat turkey evenly with marinade. Set aside for 20 to 30 minutes. Heat medium cast-iron skillet over medium-high heat. Lay a large sheet of foil on your work surface. One at a time, heat tortillas in dry pan until they are flexible, about 1 minute, turning them after 30 seconds. Stack tortillas on foil, covering them with an inverted plate until all tortillas are warmed, then seal tortillas in foil, and set them aside. Heat grill-pan or stovetop grill over high heat until a drop of water flicked onto it dances. Using tongs, arrange seasoned turkey pieces in rows on grill, placing them 1/2-inch apart. This may require cooking turkey in 2 batches. Grill for 6 minutes, turning pieces every 1 minute so they cook evenly and to avoid burning. Transfer cooked turkey to serving plate. 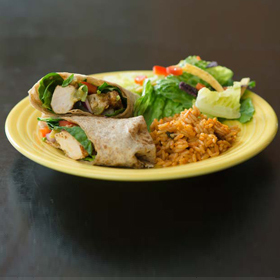 To assemble fajitas, place warm tortilla on a dinner plate, preferably warm. Arrange 1/4 of spinach in center of tortilla. Add 1/4 of turkey. Spoon on 1/4 of salsa, top with half an onion slice and 4 pepper strips. Fold in top and bottom of tortilla, then sides. Serve immediately. Cook turkey to 165 degrees to help prevent foodborne illness. Serving size: 1 fajita. Amount per serving: 317 calories, 6g total fat (less than 1g saturated fat), 31g carbohydrates, 34g protein, 2g dietary fiber, 492mg sodium.